2. 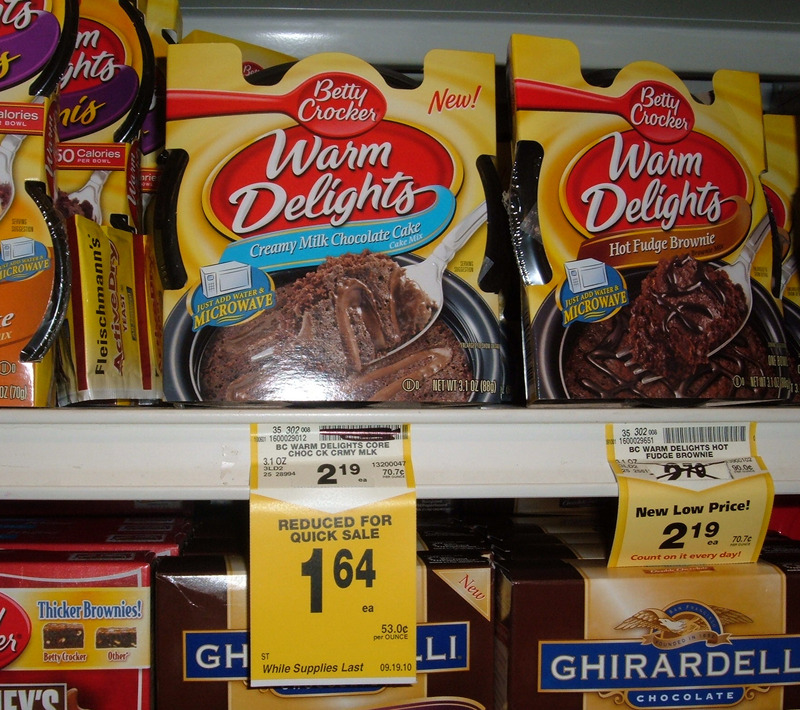 Go to ShortCuts and load the $0.75 off 1 Betty Crocker Warm Delights (expires 08/27/2010 for those that want to wait for a better moneymaker deal) eCoupon onto your Safeway card. 3. Go to CellFire and load the $0.50 off 1 Betty Crocker Warm Delights eCoupon onto your Safeway card. In addition to the Warm Delights moneymaker, I stacked a Safeway store coupon that made Wheat Thins Toasted Chips $1.69 with a $1.00 off 1 Wheat Thins Toasted Chips manufacturer coupon making each bag $0.69. 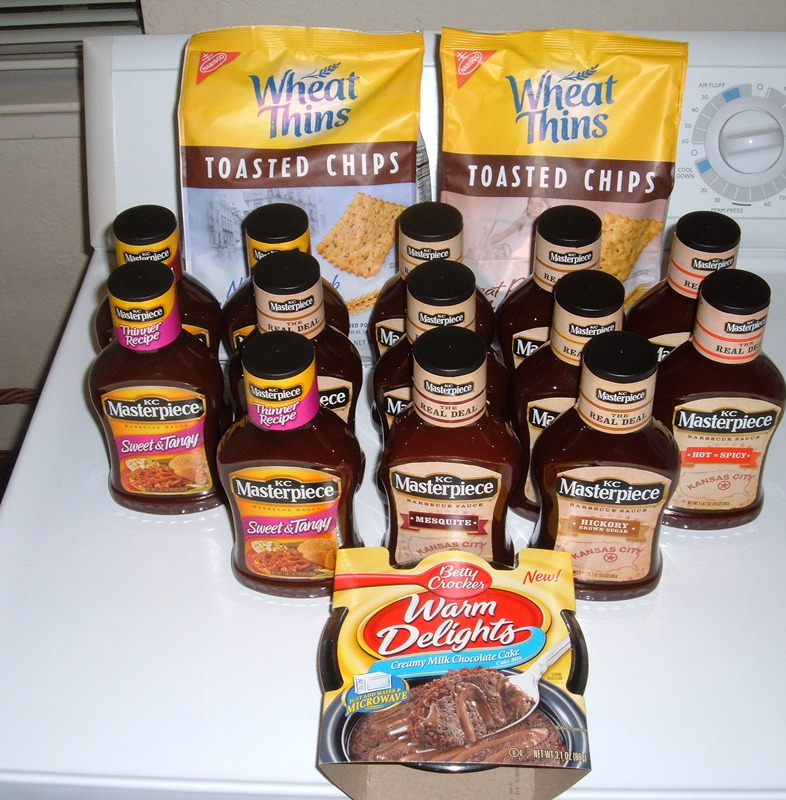 For the Safeway Wheat Thins Toasted Chips coupon to be valid, I needed to make a purchase of at least $10.00, so I also purchased 13 KC Masterpiece BBQ sauce which were on sale for $0.99 each and used thirteen $1.00 of 1 KC Masterpiece BBQ sauce coupons from the 5/9 SmartSource Sunday newspaper coupon insert making them free. When I look at this post it all looks so easy but then when I go to do it, it’s another story. I have been reading this blog for a couple weeks (and read all the back postings too) and you’ve definitely encouraged me to give this a shot. Due to a long list of medical reasons (and being currently pregnant) I am no longer working so we are trying to make ends meet on just my fiance’s salary. If we can save even half on our groceries it will make a huge difference. 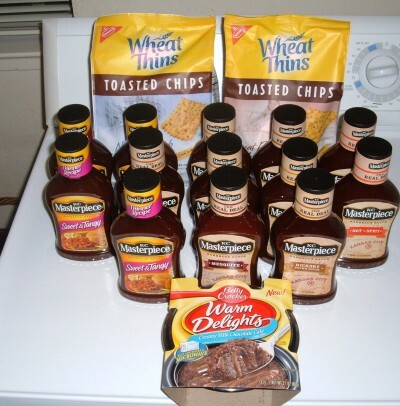 I did my first shopping trip yesterday with my new coupons and knowledge. 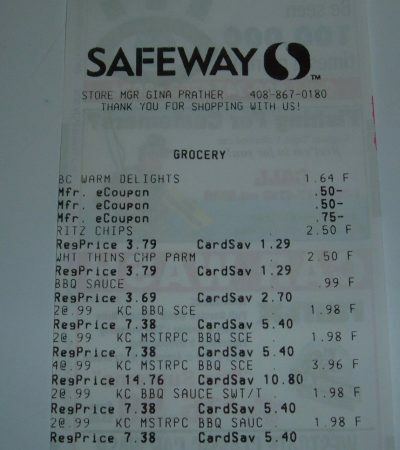 I managed to save 56% off my bill at my local Safeway brand store. I would’ve saved more if it weren’t for my two impulse buys while there. It made me giddy to see $40 worth of groceries for less than $20. That alone is an encouragement to continue learning how to do this and get better at it. This comment is really just a rather long way of saying, “Thank you”. Thanks for taking the time to share with us how to do this. A lot of people are grateful I’m sure. I live in Alaska, where our chain store specials are always 30 to 40 cents higher than the lower 48 states’ sales prices. So we usually aren’t able to do the moneymakers here. I’m so envious of your prices that enable the moneymakers! Love your website and read it daily for updates. Jeff, when you look through your weekly sales fliers, do you look through and research every single item in the flier, and then match it up to a coupon database? I’m trying to do this without spending a huge amount of time, but in my initial runs I’m finding out that I’m spending hours comparing the best deals between fliers, then checking my best price lists, then doing the coupon matching, and then researching other sites to find out if better deals can be had. Is there a faster system that you do to limit the research time, yet still yield decent results as you so cleverly seem to find? I mean, what is your systematic researching strategy that enables you not to go crazy doing this? What do you do the moment you get the sales fliers, through to the moment you walk into the store? Also, I didn’t see Warm Delights in the Safeway sales flier. How did you come across the fact that it was on sale? A run to Safeway to check out what was on sale in-store? 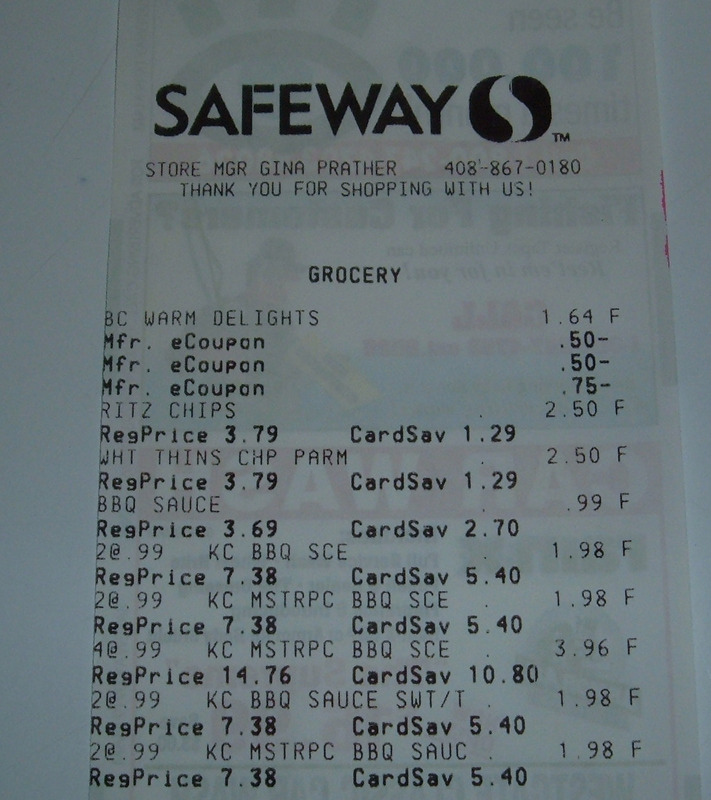 Will the ecoupons loaded on the safeway card work more than once, or are they only good for one item? 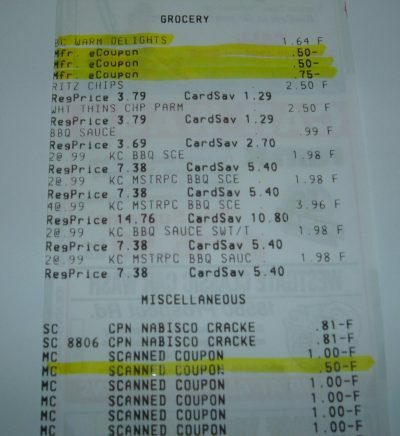 I previously loaded an ecoupon and tried combining with other coupons, but it did not appear on my receipt. Would this happen if I was already at the point of overage? Oh, definitely let the others do the work for you when you are first beginning. 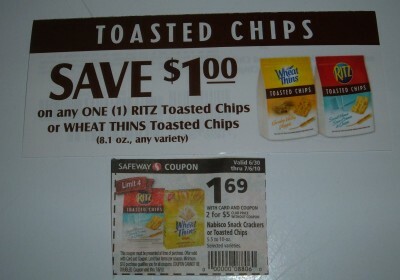 You have enough to worry about just getting the coupons straight and getting comfortable using them. It doesn’t matter if you miss some deal and blogs / websites do a great job finding most of the deals. If you have stores other than the ones being covered on this blog, find a blog that does cover them and let that blogger do all the work. I spend very little time because I now know for the most part what a “good” price is for the basics. It is much easier when you know this because there is no need to input 95% of the deals listed in the flier (because they really aren’t much of a deal). I don’t input more than 10 a week into the database. Now, if I were shopping with a bit larger of a budget, then I would probably input a bit more for things that I wanted to buy, but as for now, I am very limited. Warm Delights was just luck – I had noticed that they had eCoupons on both cellfire and shortcuts and last week they were only $0.88 at CVS, so I wondered what they were selling for at Safeway. When I saw, I realized that they were a small moneymaker. eCoupons only work once so there is no way to do the transaction again and again as you often can with Catalina coupons. No, that would not happen because the eCoupons come off first (before you give any regular coupons). Make sure that you purchased the correct size for the coupon (that is where people often mess up) and if you still think it should have come off, contact the eCoupon provider to ask why it didn’t. Interesting. So when you see multiple stacks of coupons at about the same time, does that historically mean the item may be on sale soon at retailers? I’m trying to figure out what is giving you the hunch that this money maker will be an even bigger money maker in the near future. Also, I never thought to ask, but do coupons at cellfire.com and coupons.com stack together? Warm Delights is .75 at one and .50 at the other. I can see how those are separate coupons, but are they separate coupon providers in that their coupons will stack cleanly every time, even if the prices matched? 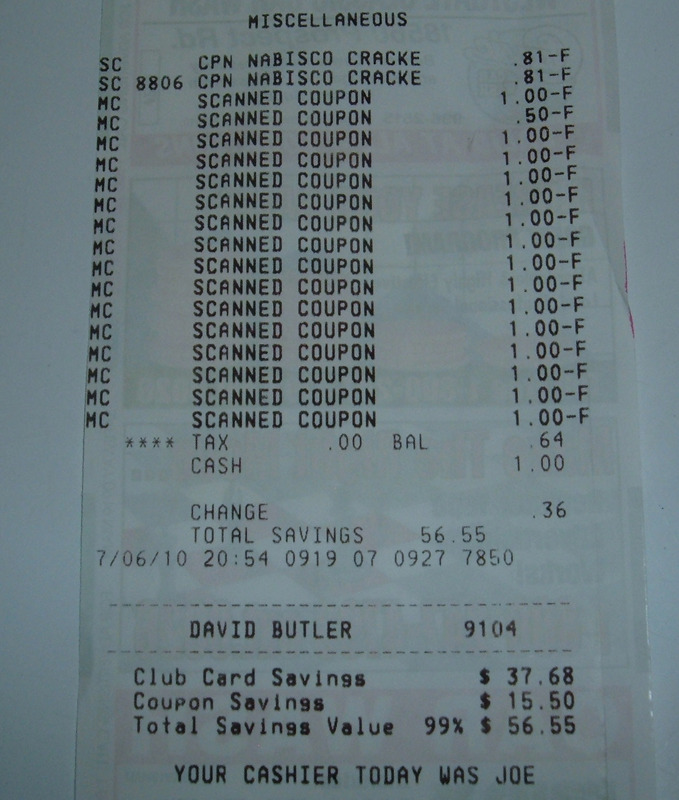 Oh and can you update your Couponing Basics guide with an extreme example of stacking coupons (like what are all the sources of stacking – ie, what can be stacked). I know its mentioned elsewhere on the site, but I can’t seem to find it. speaking of stacking, is this printable coupon for Warm Delights also stackable with your Warm Delights money maker scenario for an additional .50? So when you see multiple stacks of coupons at about the same time, does that historically mean the item may be on sale soon at retailers? I’m trying to figure out what is giving you the hunch that this money maker will be an even bigger money maker in the near future. No – what gives me the hunch that it will go lower in the future is the $0.88 price point at CVS last week. That indicates that it is an item that will go on sale for about $1 or less at some point. It is just a guess, but stores tend to have similar items on sale around the same times. do coupons at cellfire.com and coupons.com stack together? is this printable coupon for Warm Delights also stackable with your Warm Delights money maker scenario for an additional .50? I just checked the Cellfire coupon policy via the Genuardi’s (my local version of Safeway) site and it specifically says that Cellfire coupons cannot be used with any other e-coupons. It also says they “discourage” people from using a physical coupon in conjunction with a Cellfire coupon. 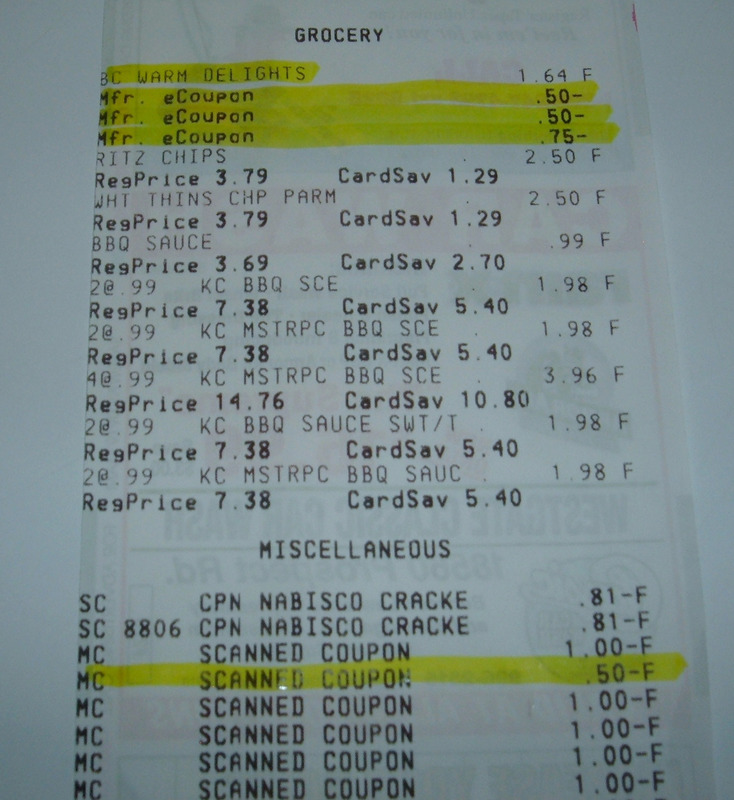 Now, is it that you aren’t technically supposed to stack e-coupons, or use e-coupons with physical coupons, or is it that they prefer you did not? Because it apparently works for you, so it should work for the rest of us, too. 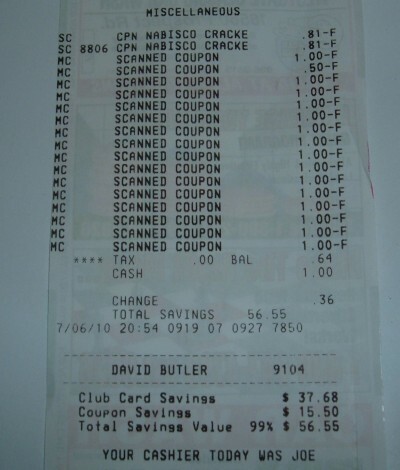 I checked around the blogosphere and it looks like Safeway has updated their coupon policy to say that you can stack an ecoupon with a physical coupon. They will now also accept Catalinas from other stores and coupons that have others stores’ logos on them. It doesn’t specifically say anything against stacking ecoupons, but I’m guessing they just aren’t advertising the fact that it can be done. They will now also accept Catalinas from other stores and coupons that have others stores’ logos on them. They will accept Catalinas from other stores for specific products, but will not accept the general $2 off your next purchase catalinas from a competing store. Thanks for this detailed explanation. Ir really helps when you take us step by step. Unfortunately I checked my Safeway today and the cheapest price on the Warm Delights is $2.19. So I am still waiting for my first “money maker”. But I did use a $2.00 Catalina coupon toward some other purchases. Also, the Friday special is $5 whole roasted chicken and I have a $1 off coupon. Sounds like a good idea since it is too hot to cook here!